Verry innovative. Definitely like it.! Work on it dada! Hmm thought provoking..mayb you should give it a try…these kinda movies create a riot sometimes…are you going to star in it? Aaah, Chennai. I miss the *awesome* sweaty weather. It kept me in shape, you know! LOL @ oil reserve! Thanks for dropping by! Thanks Titir! No no no, me not giving any try. If my boss gets wind of it then I am gone with the wind. 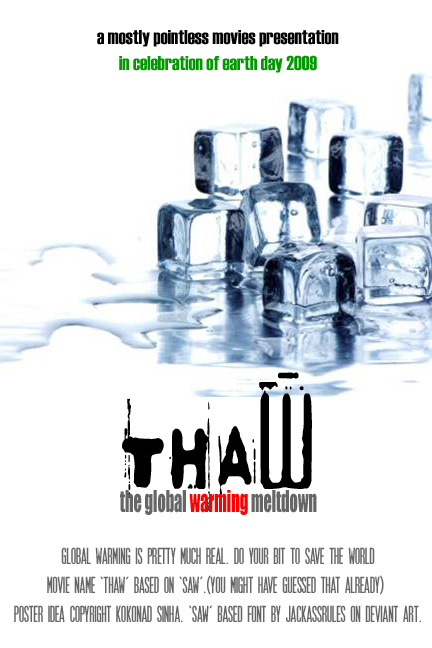 You hated Saw… but you might love Thaw. 😛 But no, not a real movie. No one is going to star in it! ‘A picture speaks a thousand words’….. very apt, indeed!